Mark Sanchez #6 of the New York Jets picks himself up after an incomplete pass against the Miami Dolphins. 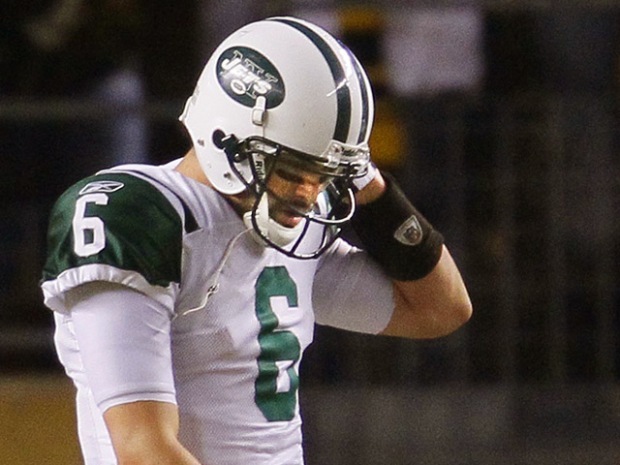 Six days after getting flattened, the Jets were just plain flat. The Miami Dolphins weren't much better but kept their playoff hopes alive by turning two early turnovers into their only points in a 10-6 victory at a soggy New Meadowlands Stadium on Sunday. The Jets (9-4) were coming off an embarrassing 45-3 loss at New England on Monday night, and coach Rex Ryan even buried a game ball in front of his team before practice to try to put that defeat behind them. This one might leave an even more bitter taste in their mouths. Much of the game was played in a downpour, which made for inept offense in the sloppy conditions. The Dolphins gained 132 yards, with Chad Henne passing for only 55, yet improved to 7-6. Miami seemed to be the more inspired team after coming up to the New York area a day earlier than usual, practicing in the Giants' facility over the weekend and even taking in a showing of "Lombardi" on Broadway. The Jets moved the ball better, picking up 286 yards. But Mark Sanchez's fumble led to the only touchdown, Brandon Marshall's 6-yard reception in the first quarter. Earlier, Nolan Carroll's interception set up Dan Carpenter's 47-yard field goal. 10 kicks for a 50-yard average. Nick Folk hit field goals of 35 and 42 yards for New York, which has lost two straight and faces tough road games at Pittsburgh and Chicago. For a team that has Super Bowl aspirations, the Jets are now two games behind the Patriots (11-2) in the AFC East. The Jets won the coin toss and chose to receive rather than defer for the first time in Rex Ryan's tenure. The defensive-minded coach said he would do that to let the offense get off to a faster start than it had the last several weeks. Instead, New York went three-and-out, and Sanchez was nearly intercepted by Sean Smith on third down. The Jets started their second offensive series with a big mistake by Ben Hartsock, who was called for a personal foul for grabbing a facemask, making it first-and-25. Three plays later, Sanchez forced a pass to Santonio Holmes that Carroll easily picked off. Miami took advantage, getting the 47-yarder from Carpenter to take a 3-0 lead midway through the opening quarter. New York turned it over again on its next possession when Kendall Langford sacked Sanchez and forced the ball out, and Quentin Moses recovered at the Jets 26. Miami again capitalized as Henne found Marshall from 6 yards out between Bart Scott and Eric Smith in the end zone, giving the Dolphins a 10-0 lead with 2:48 left in the first quarter. The Jets got the ball at the Dolphins 38 after a fumble in the second quarter, but in a play that summarized the day for New York, Holmes dropped a perfectly thrown pass while he was wide open in the left corner of the end zone on third down. New York settled for a 35-yarder by Folk to make it 10-3. After the Jets started another drive in Miami territory following a fumble in the third quarter, New York went three-and-out to a chorus of boos from the rain-soaked crowd. Folk's 42-yard field goal made it 10-6 with 5:21 remaining. But that was it for New York as the offense couldn't do anything more, with the game sealed on a Dolphins sack on fourth-and-15 in the closing minute.